“Our colleagues in journalism, as much as we, are still looking for a way to write about the Roma and about Roma-related issues in a way that is not too ethnic; in a way that is not colored by various prejudices and stereotypes,” says Jarmila Balážová, co-founder and chair of Romea Civic Association, a Romani media and education organization. Jarmila Balážová is a woman in demand; a woman with charisma, vision and an uncanny amount of energy. She is an award-winning journalist and the driving force behind a number of programs and publications, including Czech Radio’s Romani radio broadcast, “O Roma vakeren,” which she founded and the Romani monthlies Amaro Gendalos and Romano voďi, of which she is editor-in-chief. Balážová is also a producer at Czech Radio 6, the former broadcasters of Radio Free Europe in Czech. Balážová established Romea in 2002, along with a group of others, following a training of young Romani journalists, offered by the Dženo Association. Zdeněk Ryšavý, who is now the executive director, was also one of the co-founders. Romea runs a press service as well as an internet news server, which reports on events from the world of the Roma, and is, according to Romea’s annual report, currently the country’s most-visited Romani server. The server regularly broadcasts TV news reports on ROMEA.tv in both, Romani and Czech language. The monthly Romano voďi, which Romea publishes, provides coverage of current events from the world of the Roma as well as articles on Romani literature, music, history, language. A portion of the magazine is directed at young Roma, who can find pages that profile active and successful Roma and a two-page section “Through Our Eyes” focusing on “youth” themes. Romea also produces “10 Minutes”, a talk show which profiles interesting Romani guests. I had the opportunity in late August to talk with Ryšavý and Balážová at their office about their work and Romea’s role in the Czech media landscape. When asked to discuss the mission of Romea, Balážová explains that providing information, but also monitoring the press for factual accuracy are some of the key roles her organization plays. Balážová says that occasionally positive coverage does appear, especially on Czech Television, and especially about children. She, however, points out that Roma-related topics are often viewed as their own separate domain. Regarding dreams for the future, Balážová jokes: “World peace.” But then gets more serious, describing how over the last eight years of its existence, Romea has always struggled with funding and has had to rely on volunteers, in addition to the core paid staff. Balážová explains that, even at the price of getting funding cut, her organization is critical. Because of that, she says, they have gotten “smacked across the fingers regarding taking on new projects,” as she calls it. As a white woman involved in advocating for equal rights for minorities, I was curious about how Ryšavý wrestles with the fact that he is white in an influential role in a minority organization. 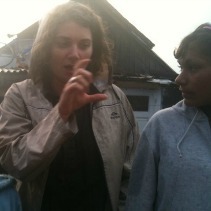 As a white person, closely familiar with issues affecting the Roma, a person like Ryšavý has the unique position of serving as a bridge between the two groups. Ryšavý says he can influence the majority population’s perceptions of the Roma by challenging his white friends when they say prejudicial things and engaging them in a conversation. “It does work,” Ryšavý explains. “At most you can influence your circle of friends, which is maybe two hundred people. It is possible. But the media influence people’s opinions more.” That is why Romea’s work of bringing information from the perspective of the Roma to the public is so crucial.